This week’s theme for the Clickin Moms P52 was Inspired By. The idea was to find another artist or particular piece of art that we loved, & to use that as inspiration for our own work. We didn’t have to replicate another piece, just use some aspect of it as inspiration – color, lightning, mood, theme. My plan was to sit down & go through some online art galleries to choose an artist or a painting for this week’s project, but it has been one of those weeks. Between cleaning house for Super Bowl Sunday, cooking snacks for Super Bowl Sunday, having company over on Super Bowl Sunday, my husband’s birthday, homeschool, & a trip to the Imaging USA expo in Nashville on Monday (so much fun) I completely ran out of time for art research. So…I decided to go with something else that I’ve been wanting to try for a long time. I have been in awe of Melissa Gibson’s Toy Project for a very long time. I love her use of light, & I love the way her toys looks alive, as if they are about to stroll out of the frame at any moment. I’ve also followed a few other photographers who use Lego minifigures in different scenes, some of which are unbelievably creative. 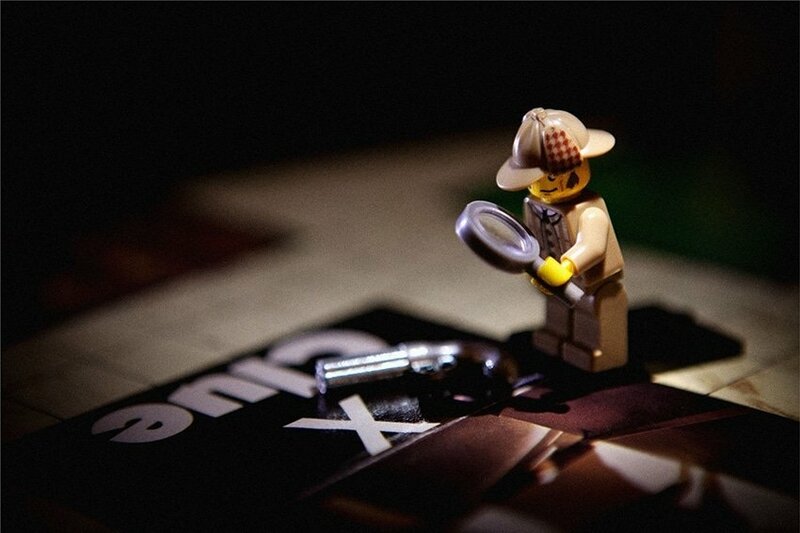 My mom brought us my old Clue game to play with the kids at Christmas, so I convinced my son to dig through his billions of Legos & find his detective so I could set up this shot. I wanted it to have a noir kind of lighting, very harsh light and deep shadows. I had been fiddling with it for several minutes, taking lots of shots, but couldn’t quite get the look I was after. Then, just as I was about to take another shot, my son walked over and held his Harry Potter wand with the light-up tip over the detective’s head. “Look, a chandelier,” he said, then started to wander off. “No, wait! Don’t move!” I told him. The wand gave me just the look I was going for. I added a little grain and a vintage wash to add to the noir effect. Follow the blog circle to see more interpretations of this week’s theme. Next up is Kristy Wolfe. Clue is an old family favorite of mine. I played it for hours with my sister. I still have the pieces and board — but not the box — of that childhood set, and since then I’ve gotten two new sets. Well done on achieving your vision! Thank you, Michele! I love the old version of Clue best, but I have to admit I kind of want the Sherlock Cluedo version, too! I find Melissa Gibson inspiring also, great job!